It takes very little to make me happy. Some of the things that make me positively giddy are Papers! As I’ve said before, I am in love with papers. 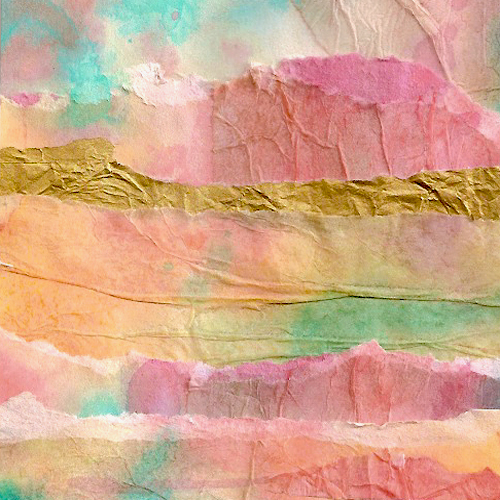 The sheer variety of handmade, hand painted, and found papers is dazzling. And as my stash grows, they become more and more fun to look through and admire. But now I’ve discovered a new addiction — gorgeous bits! 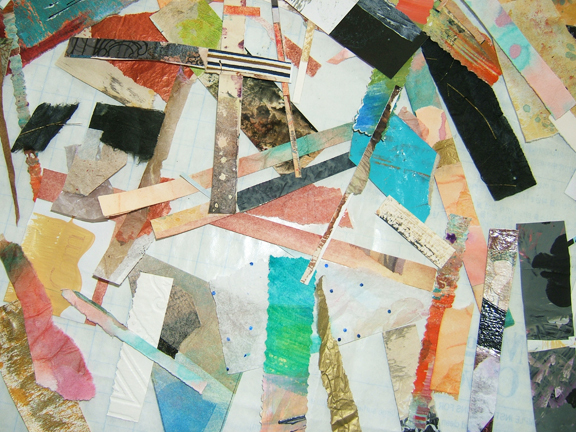 You see, when I’m creating a collage I can’t throw away my trimmings if they contain anything of interest at all. In fact, these little bits are just what I need sometimes to add an unexpected little jolt of color or interest to a collage that might need something extra. So I keep my little bits in little plastic zipper bags, and they accumulate, and accumulate, and . . . well you get the idea. Today was another one of those beautiful days to be out on the screened porch doing collage. I started with several pieces of some freshly-painted papers. For the collage shown below, the colors are a little brighter than I would normally use in an abstract landscape collage, but they were so delicious that I just had to try it. And the trimmings from that collage went into my little bag of gorgeous bits for future use. My collage . . .
Do I understand, Martha! The accumulation of paper is almost unmanageable. I keep bits separate from strips and that helps a lot. Sometimes I need bits andf other times I need a strip. Also I like boxes better than bags so I can more easily paw through the collection. In the end it’s simply what works for each artist. Jo, you may be onto something. I have many, many bags. I need to at least get some of the contents into categories, such as “text” “maps” “vintage print” etc. Wouldn’t that be a wonderful dead of winter project! And boxes. Yes, boxes! I would love to play in your sandbox. What fun with all the bits & pieces! Pat, if it’s saving your sanity, then that’s the way to go. You could of course get a second basket, and a third, and so on. It would be so much fun for a few of us to get together for a bits and pieces swap! Maybe we could at least do it online and through the mail. So true, Shirley! They do let us know. I like how the “trimmings” contain bits of different papers from the original collage. Those combinations can be wonderful sometimes. Every sliver of paper is valuable. What great shots of your stash. Makes me want to collage right now! 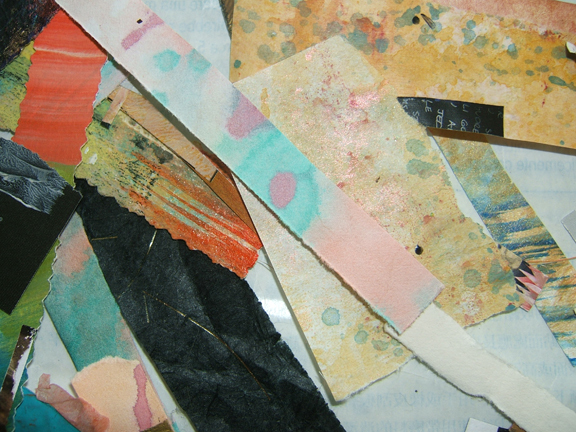 I have boxes, and boxes of hand dyed paper. Maybe we should organise a paper swap. Not to include your precious pieces, of course. But wouldn’t it be interesting to have an online exhibition to see how they were all used! It really would, Myfanwy. And Of course I’d want to include mine! All I’d have to do is figure out the logistics of how to do a swap and a subsequent exhibition. Thinking, thinking! So much loveliness Martha – lovely to look at, good for the planet, great for your soul.